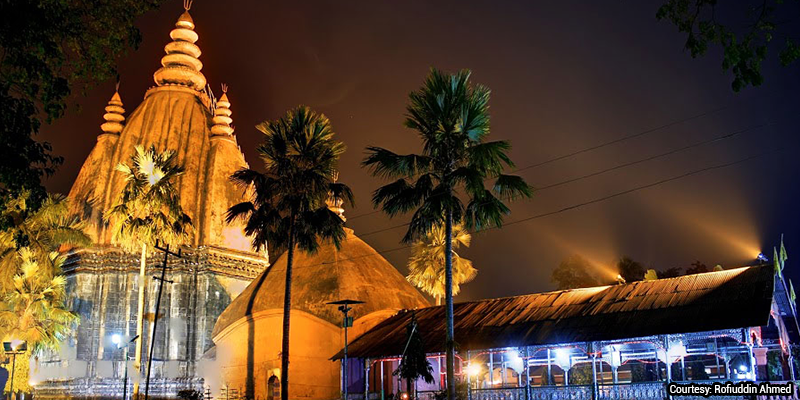 Assam is a tourist’s dream destination – largely unexplored and filled with scenic destinations. But it has also been stereotyped as a destination to view the Rhinos and tea gardens. There are only a handful of destinations that tourists really know about. It is no surprise then that most of you might never include Sibsagar in your travel itineraries. Known as the “Temple Capital of Assam”, Sibsagar is situated in the picturesque Upper Assam, 360 KM away from Guwahati. Though temples are the prime attraction of Sibsagar, it also offers the travelers a scope to sneak into the marvels of Ahom architecture. Sibsagar was also an important base for the Ahom rulers and has iconic landmarks of 600 years of Ahom rule. 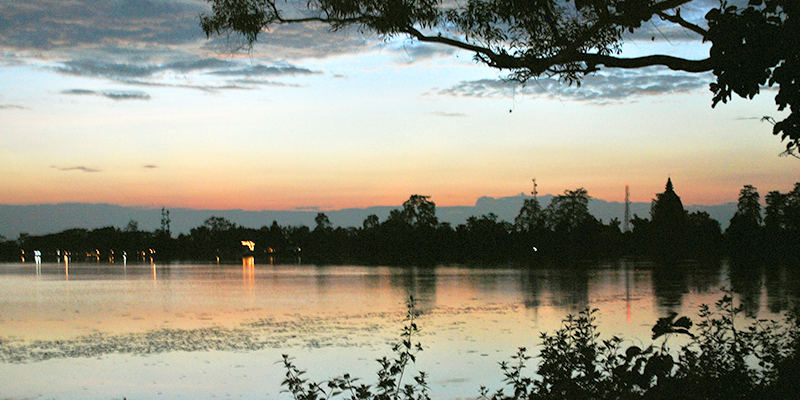 What should you explore while in Sibsagar? Let’s see. A temple dedicated to Lord Shiva, it is situated between Vishnu Dhole and Devi Dhole. One of the tallest temples in the world, it stands at 180 feet and was built by Queen Ambika in 1734. The temple is built on a raised platform and can be viewed from any part of the town. The walls of the temple are decorated with beautiful sculptures and the ambience here is very peaceful. In the same complex, there are two other temples or ‘dhole’ dedicated to Lord Vishnu and Devi. One must pay visit to all three temples for an enriching spiritual experience. From spirituality you can take a leap to viewing the beauty of nature. Next to the Shiva Dhole is the Sibsagar Tank. Built by Queen Ambika in 1734 and named after her husband, King Shiva Singha, this tank was constructed to ensure regular water supply for the residents. According to popular myths, it is believed that the Queen prayed to God for a steady source of water, and miraculously, the next day this lake appeared. The tank showcases engineering marvels of the Ahom kings as the water level of this tank never drops below the minimum limit, throughout the year. The surroundings of the tank are haven for nature lovers. Especially during winters, one can spot beautiful migratory birds in the lake. Some people visit the tank for a hot cuppa while enjoying the sunset sitting in one the many parks around the tank. 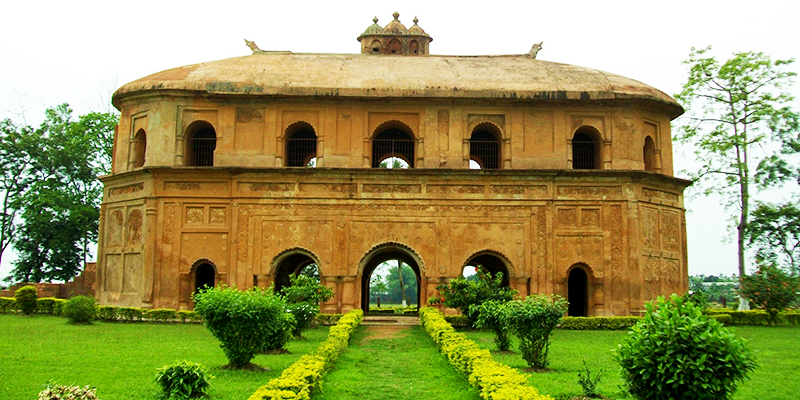 Indian cousin to the famous Italian Colosseum, Ranghar is the pride of Ahom architecture. It was used as an amphitheatre by the Kings who enjoyed watching sports in the arena. Built by King Pramatta Singha, this amphitheater was used to watch several conventional Assamese sports like bird fighting, bull fighting etc. by the royals. It is regarded as the first structure constructed in Asia for a specific purpose and not as a general building. A mixture of sticky varieties of rice, locally called Bora Chaul, was used to build this building. The grains of which can still be seen. 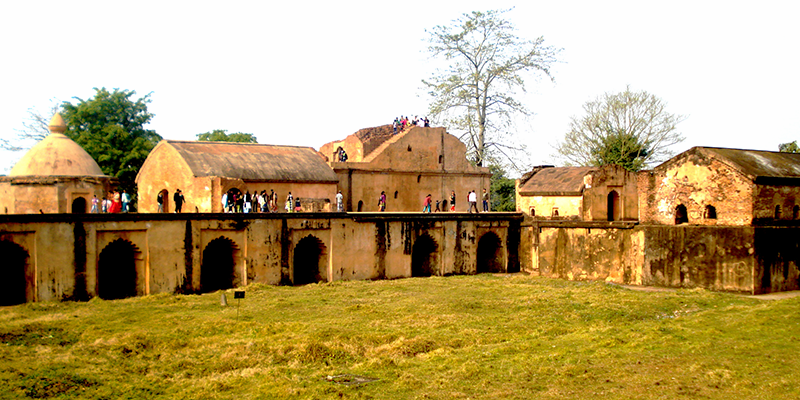 Kareng Ghar is the remains of the royal palace of Ahom kings when Garhgaon was their kingdom’s capital. Garhgoan was the principal seat of the Ahoms for over four centuries. The chronicle sources refer that Suklengmung, the 15th Ahom king established the capital at Garhgoan and constructed a palace with wood and other impermanent material in the year 1540 AD. Later, King Pramatta Singha constructed a brick wall and masonry gateway in the capital complex. The present multi-storied edifice was built by King Rajeswar Singha in 1752 AD. 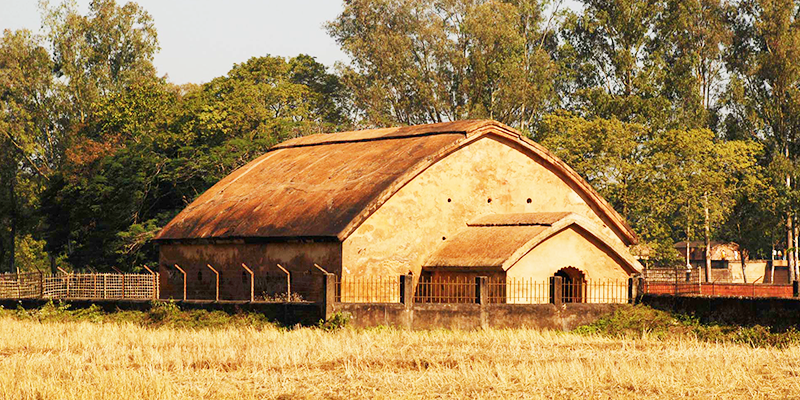 The structural remains in the fortified complex stand as a mute testimony of the Ahom kings of the bygone days. It is rumored that there is a secret passage connecting Kareng Ghar to Taratal, which is several kilometers away and on the other side of the river Dikhow. Historical documents mention that the city of ‘Rangpur’ was established in 1698 AD by King Rudra Singha. When he established his kingdom, he built a palace made of wood and other locally available materials. And thus came up the Talatal Ghar or abode of the royal family. The royal palace has three storeys above the ground while four storeys are underground. Poor maintenance over the years has resulted in the destruction of wooden construction in the upper storeys and the underground storeys are closed for the tourists. However, one can still see the remaining of the palace and the beautiful gardens around it. Situated about 12 km from Sibsagar, over the Namdang River, this 300-year-old bridge was made out of a single piece of rock. The Namdang Stone Bridge was built in 1703 by the prominent Ahom Dynasty ruler King Rudra Singha. Sources suggest that the bridge was constructed by the skilled craftsmen of Bengal and brought to the state after completion. 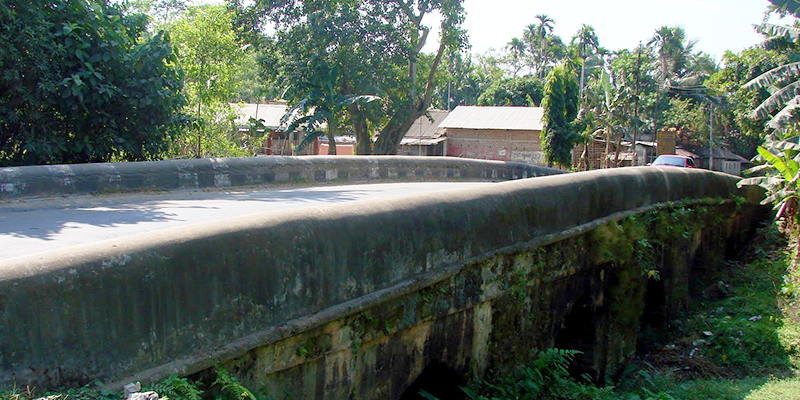 The genius of the craftsmen has kept the bridge still in working condition and it is a part of the present day NH-37. This bridge connects Sibsagar, Dibrugarh and Tinsukia to rest of the country. Situated on the foothills of Nagaland, about 28 km from the town of Sibsagar, Charaideo is a sleepy town with a glorious past. 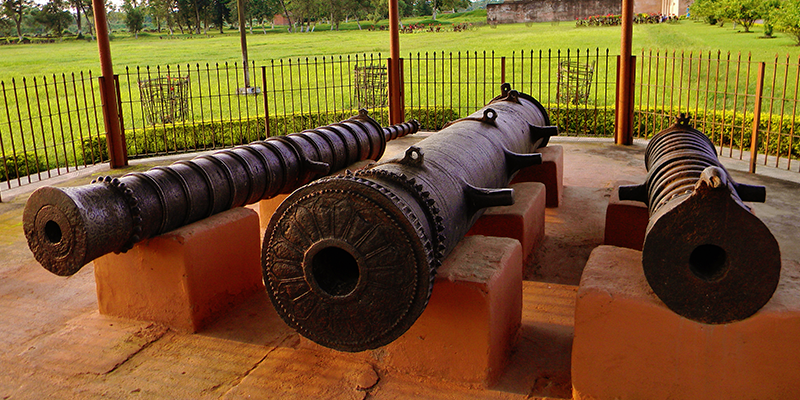 In 1253 AD, Charaideo was built by King Sukapha who was the founder of Ahom Dynasty in Assam. 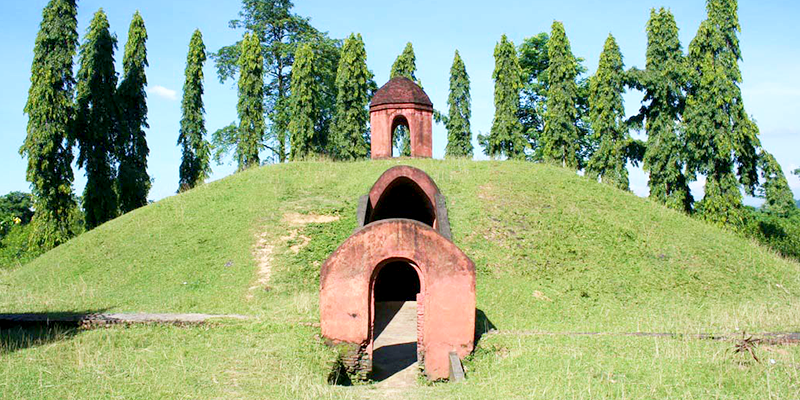 Today, the hillocks are known for housing 42 tombs of the Ahom kings and queens. Excellent craftsmanship and architectural skills of medieval Assam can be seen in the pillars and burial sites strewn over this place.